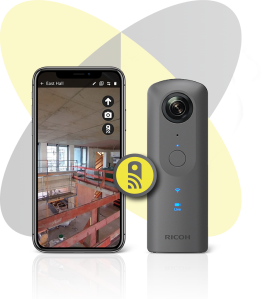 Learn how to set-up your LIVE streaming solution for 360° real-time construction progress monitoring in a few simple steps. What do you need to get started with 360 SiteStream? Web browser to access your live stream(s) in the HoloBuilder Web Viewer. One or more Ricoh Theta V camera(s) in WiFi client mode with 360 SiteStream plug-in installed. For Mobile/Cellular Access Point at least 3G connection required, UMTS HSPA is recommended. Tripod plus Extension Adapter TE-1 so that the camera can be connected to a power supply 24/7. You will also need an electric plug + USB adapter to provide the camera with constant power supply. Please note: The camera will automatically restart if it fails for unknown reasons. Mobile Device (iOS or Android) with the HoloBuilder JobWalk App installed. How to configure your hardware and software for 360 SiteStream? Learn everything in the video or read our tutorial. In the case of any question please do not hesitate to send us an e-mail at any time! If you are new, you can also schedule a HoloBuilder demo with a representative.